Hello Bloggers, I'm sorry for not having anything new to look at if you've visited lately. I seem to be working flat out but not accomplishing very much. Below are three cards I made for FatCats Card Corner . This one uses the new Cuttlebug Pinking Stitch Embossing folder with matching border. I have cut small rectangles of three different papers and distressed around them with London fog Memento ink, my plan was to make it look like a patchwork quilt. 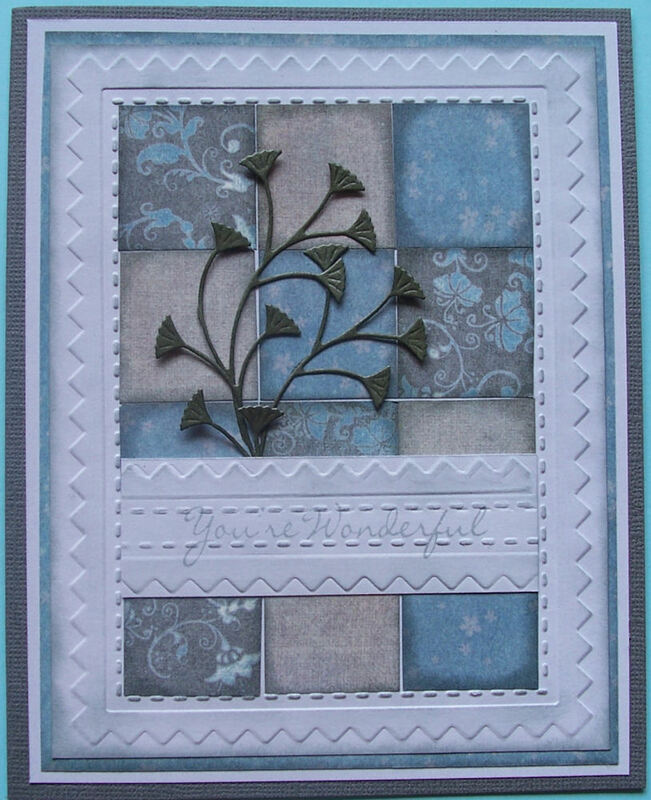 I then cut a strip of the same card stock and used the border folder first along one edge then the other. 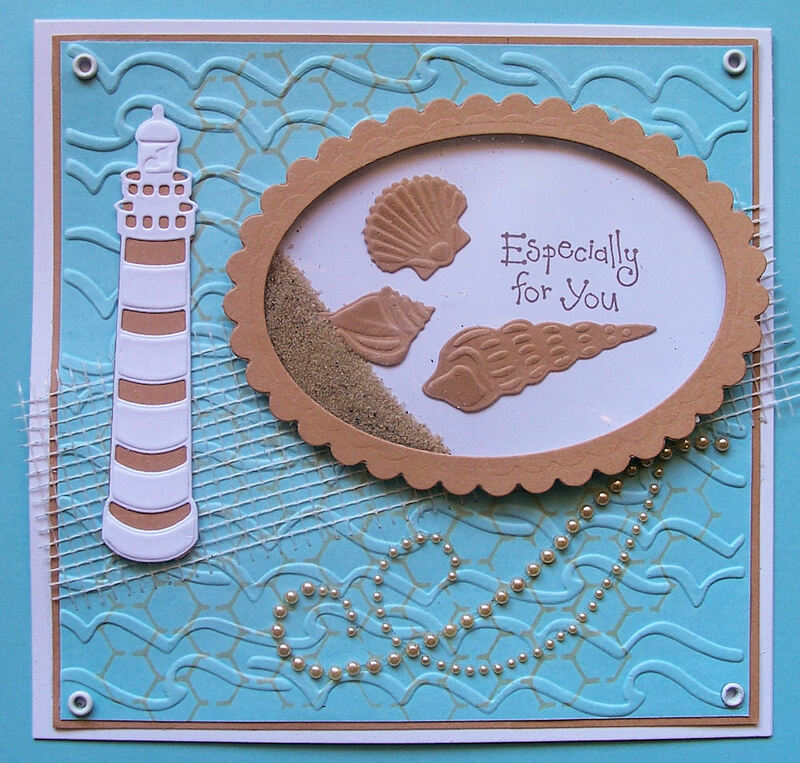 For this one I used the Crafters Workshop Chicken wire stencil (meant to represent a fishing net), and then embossed over it with the Fiskars texture plate Ocean. I used the Marianne Creatables Lighthouse and Sea Shells to make my shaker card and used some sand from my grand daughters sandpit when they were little. Some self-adhesive plaster board jointing tape, a self adhesive pearl swirl and eyelets in the corners. 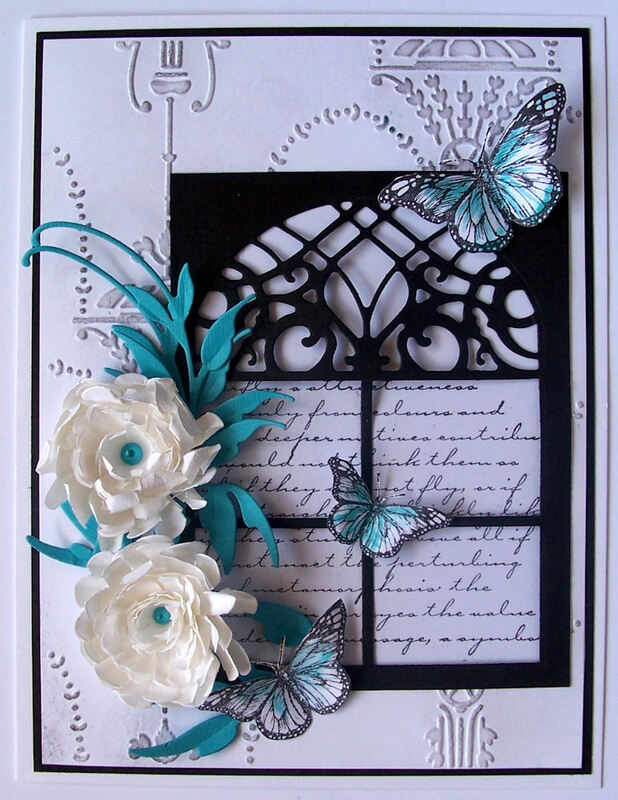 For this card I used the Couture Creations Victorian embossing Folder and swiped over it with Memento Tuxedo Black ink. The window is a Cheery Lynn Die. 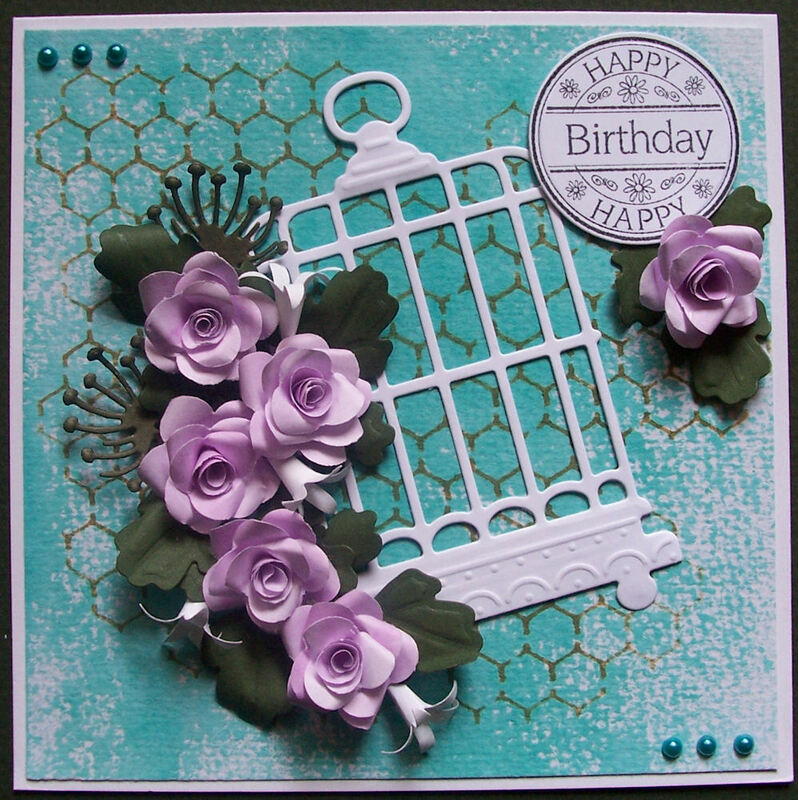 The butterflies are from a Stamp-It stamp set..
My last card is one I made from an idea Angie saw in a magazine which was to separate your two layers with some sort of swirl. 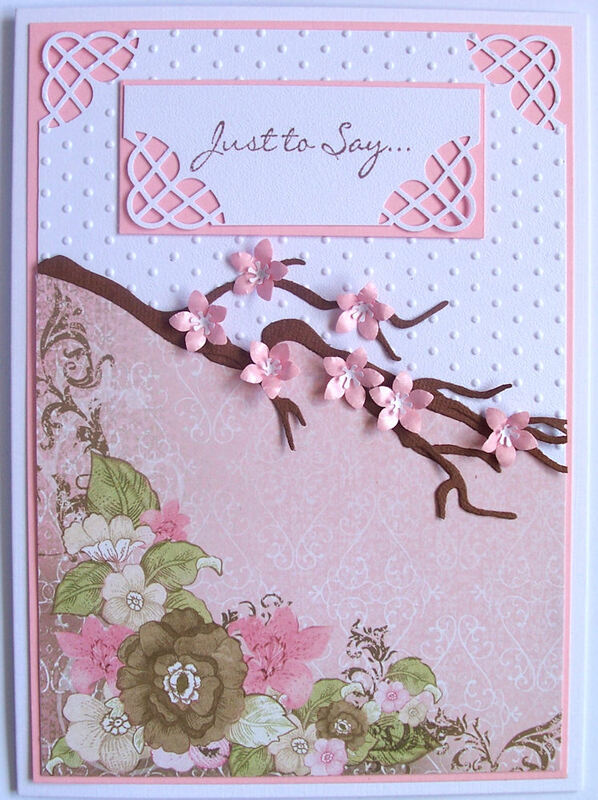 I used a quickkutz branches die and added some flowers made with a small Sakura punch and a Punch bunch mini asterix for the centres. The corners were cut with the Martha Stewart String Lace Punch. Thank you for taking the time to come and visit. Hello, for my card today I inked up the background with Peacock Feathers Distress Ink and using The CraftersWorkshop mini Chicken wire template sponged over some Frayed Burlap Distress Ink. The bird cage is a Marianne Design Die. The roses I made with the 32mm Vinca punch. Leaves are Spellbinders Foliage and Marianne Creatable dies. The sentiment is from Lily of the Valley. I received a new window die from Kaaren, its from Cheery Lynn and I had to have a play right away. 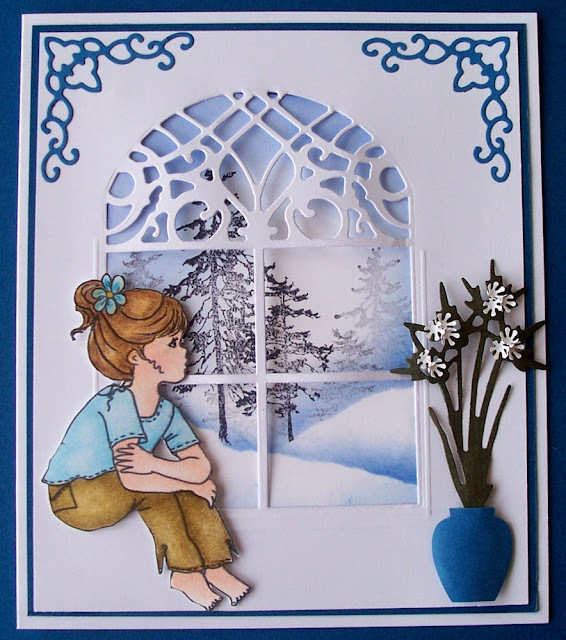 I started by stamping the view, Tutorial here from the amazing Theresa Momber I love her work. The image is from a Joanna Sheen CD Daisy and Friends I coloured her with Prisma Pencils. The plant in the pot is a Marianne Creatable die Anja's Leaves 4 and the pot is Carl Punch. The corners are Cheery Lynn Lace Corners B Die. I think I might need a new camera my old Kodak just isn't giving me any pic. I'm happy with.